As you get ready for another weekend of football, check out how these stadiums from around the world are taking charge by going green. Located in Philadelphia, Lincoln Financial Field makes a concerted effort to recycle and reduce waste. Approximately one third of all game-day waste is recycled and saved from a landfill. In addition, each year, Lincoln Financial composts 25 tons of water, and converts it to kitchen oil and biodiesel. Lastly, the stadium is home to more than 11,000 solar panels and 14 wind turbines, which produces a staggering 3 MW of peak power. Recently built, this stadium located in Brasilia, the capital of Brazil, has a solar power mega system as well as an advanced irrigation system to reuse rainwater. The solar panel energy system, which is constructed on the perimeter of the stadium, has the capacity to generate 2.5 million megawatts of energy. To put this in perspective, one megawatt can power over 300 homes for an hour. Home to both the New York Giants and the New York Jets, MetLIfe Stadium is 30 percent more efficient than the Meadowlands, the stadium it replaced. Parts of the old stadium were even recycled and reused to build MetLIfe. The stadium has vast systems in place to compost waste, utilize solar energy and encourage recycling. 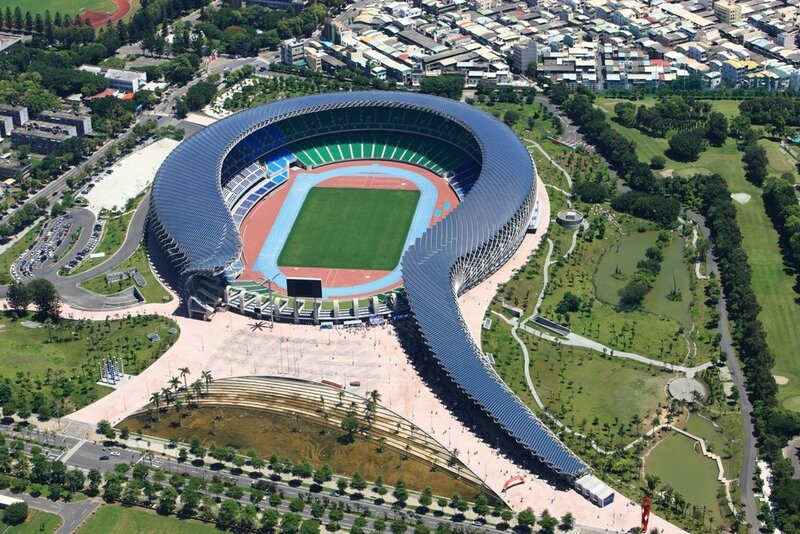 Found in Tawian, Kaohsiung Stadium contains nearly nine thousand solar panels that generate 1.14 MW of peak power. In addition, the materials used to construct the outer ring of the stadium, which looks like a question mark, are 100 percent recyclable. Mane Garrincha Stadium, Brazil [Digital image]. (n.d.). Retrieved from http://www.wallpaperbetter.com/wallpaper/558/497/128/estadio-nacional-mane-garrincha-brazil-fifa-2014-2K-wallpaper.